26 year old Emily Ross has been with Special Olympics Alberta since 2004. She participates in cross-country skiing and athletics. Tijana has been a Special Olympics athlete for over 10 years. She is one of the first graduates of the Special Olympics Yukon school based program. Currently, Tijana trains and competes in golf, figure skating and bocce. 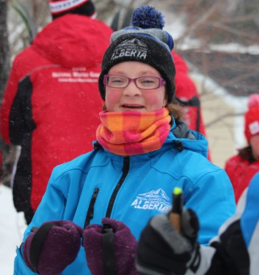 The highlight of her sport career was this past March while participating at the Special Olympics Canada 2016 Winter Games where she won a Gold Medal in Figure Skating. Tijana is happiest when going to Special Olympics programs as she enjoys spending time with her teammates. CF|24 is not affiliated with CrossFit, Inc. CrossFit, Inc. does not endorse, sponsor, or sanction this work or any content or opinions expressed herein.